Ok, here is a snapshot (from a pedestrian/sidewalk vantage point) of the grate just to the left side of the Homewood Cemetery gates on Forbes Avenue. The bike lane ends and the “shared” lane narrows shortly before this tire trap. Sorry there’s no scale reference in the image. The gap opposite the curb is ~2″ wide and about as deep. Pseudacris’s photo might be more a problem from the holes around the grate than the grate. True, we should change these out, since hitting one will cause a serious bump, but that center bar will prevent your wheel from falling completely in, as in the West View and Babcock photos. As we gather these, I see a need to categorize. 1) Grates that, by their design, have slots big enough to eat a wheel entirely. 2) Grates that, by their design, have slots in line with the path of travel that a road tire could get seriously pinched, but are not as wide as the previous one, e.g. 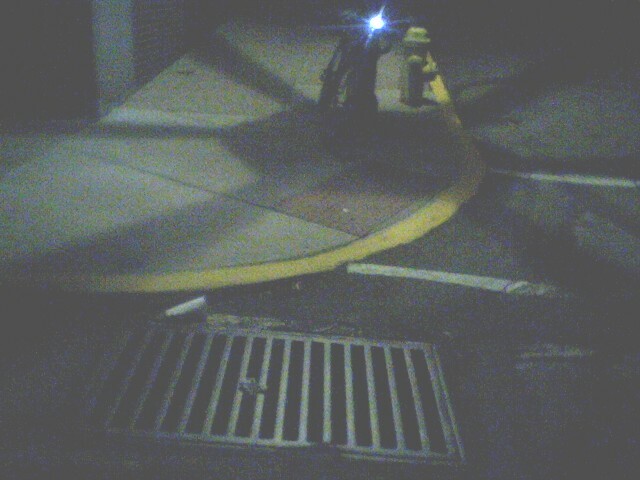 the Smallman/14th and McIntyre Square grates. 3) Grates of that same type but which, by their positioning, are not an immediate danger to travel. 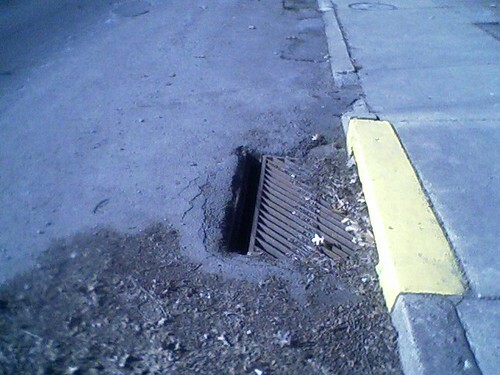 5) Grates with serious pavement issues around them. 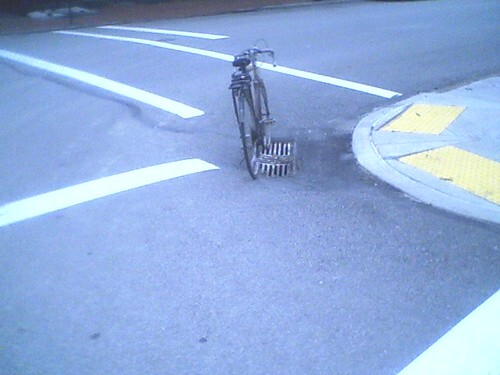 Whether or not the grate itself is bike-safe, the holes would be enough to cause a potential overthrow. 6) Grates whose design is less than ideal, but not egregiously unsafe, i.e., won’t eat a wheel but will cause a nasty bump. The grate itself, minus the bad pavement, in Pseudacris’s post, is of this type. If I had nothing to do for a month or two, and someone was willing to pay me for my time, I would willingly inventory them all, city- and county-wide. On the point of cost, we’re talking about $1000 a grate, $500 for the grate and a similar amount of labor. By comparison, a single traffic light is a minimum of about $100,000. Like Scott guesstimated, there might only be a couple hundred that of primary concern in the entire area. Yeah, the Forbes grate that Pseudacris posted is really bad, even worse than the photo shows – deep grooves on 3 sides. 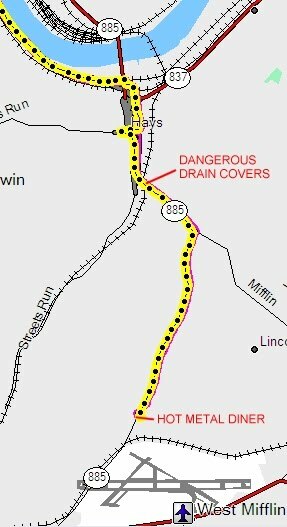 It’s pavement damage, not the design – that sewer has been flooding recently in heavy rains. Luckily it is at the top of a long climb so you’re unlikely to hit it at any speed. On the other hand, it’s in an unmarked shared lane that’s an important commuting route – plenty of opportunity for drivers to get ticked off by a slow cyclist taking the lane there. I keep meaning to call 311 about it but I forget. The other grates on Forbes just the same except flush to the pavement. These are totally passable, though they make me nervous (I usually swerve around them because I’m chicken, but I’ve ridden over them with not even a jolt). My beau rides right over them on his road bike. There’s even room in the bike lane to pass them. I wouldn’t worry about changing them until there’s a chicken in every pot…or whatever the cycling nirvana equivalent is. place) on the uphill before the turn onto highland. considering it costs about $250 for a thermo turning lane arrow, i’d say it’s a bargain. I counted five of the #4 variety on northbound Perry Highway on the half mile between the front of Pines Plaza and Perrymont Road last night, and I know there are at least three more north of that. Again, it isn’t so much the grates as that one-inch notch between the grate and its enclosure. Once every 50 passes or so, I get dangerously close to nailing one of those slots dead-on. It’s only one inch of a 15-foot lane, but all you need is one. That’s one mile of one road one direction. How many more are out there, even the 4s, 5s and 6s? By contrast, on the mile or so of Penn Ave between Free Ride and Shady Ave, I crossed 10 grates and didn’t even flinch. They’re the right type and flush with the pavement, close to perfect. Thanks for tracking all of these, Sara. Here’s another one: Railroad St at 31st. 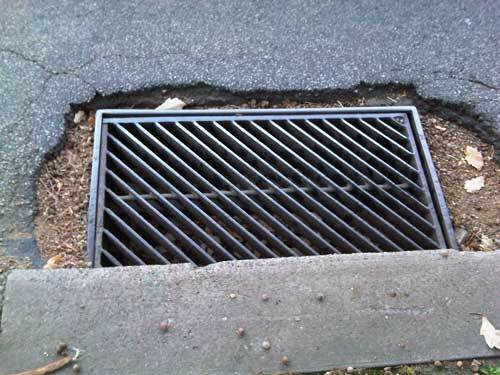 It’s about a 5 or 6 inch drop into the grate itself, then of course there are the longitudinal slots. This has trip to the hospital written all over it. Yipes! That’s a good one. I’ll ad it to the list! There is one on outbound Steuben St in the West End near Sanctus. It is of the same type as the one Scott just pictured. A little farther out Steuben, there’s one on the inbound side near Stratmore. 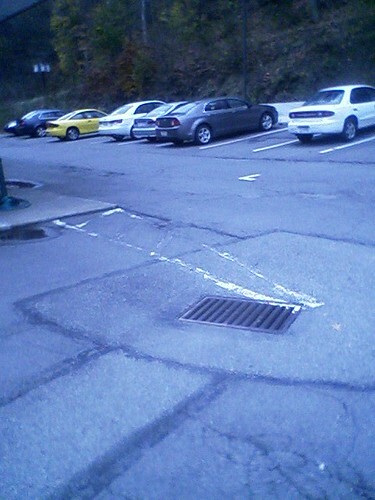 New category: Type #7: The gaping-hole drains like the one at BlvdAllies/Ward. These are not as dangerous as those with longitudinal slots in the riding lane. Under the right conditions (being forced too far right when it’s icy, for instance), you could slide right into one — maybe a whole wheel and leg. Yes, I’d say they’re hazards which should be addressed. Please include them. But I think the focus on fixing them should be on types #1 to #4.
penn between 11-16th is riddled with them. They’re fixed one. there’s quite a few more…hopefully with some time! This one is on private property, but nevertheless is of the worst type, and right in the path of travel. Located in the Eat & Park on McKnight Road, southbound, just beyond Browns Lane, in Ross Twp. I’m not sure what we do, if anything, for ones like these. 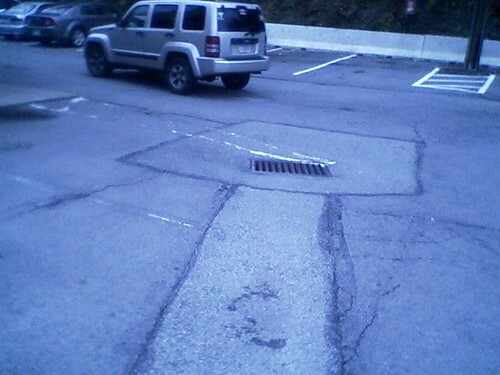 Probably just point out the potential safety hazard, and suggest that the next time they get pavement work done, they kick in the couple hundred bucks to replace it. That little notch between parking spaces also says to me “nice place to put a bike rack”. 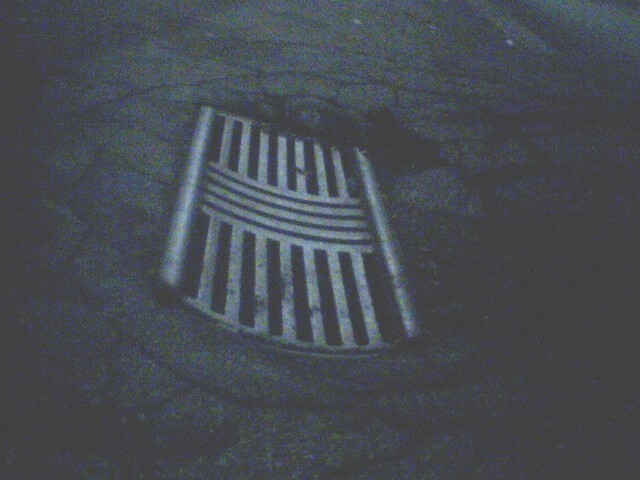 Blah blah blah, dangerous drain grate, blah, hazard, blah blah, liability, blah blah, lawsuit, blah blah. Blah, blah, blah private property. Blah blah blah, and anyway, when was the last time anyone rode a bicycle into an Eat-n-Park on McKnight Road? With the number of rubber mats and “caution, wet floor” signs, warnings about undercooked eggs, salting on sidewalks, etc. I’m guessing these businesses are concerned about dangerous conditions which they might be liable for on their private property. According to my son, he’s ridden a bicycle through there himself three times this week already. I didn’t know that when I posted the photos. There are about 3 on Zoo hill going up, 2 currently covered by leaves. Earlier this week I noticed that the grate Pseudacris mentioned on Forbes (near Homewood Cemetery) has been patched. Yay! I even rode over it on my way to the keg ride. Then, in Millvale, there are two I got photos of, and at least three more that it was too dark, and I was only on two streets. Who knows how many there really are in that little town, which otherwise is fairly bike-friendly. This one is at Grant & Hays Alley. The grate isn’t all that horrible, but the hole it’s in would be a nasty bump. It’s just out of the line of travel, but not by much. One block away, at Grant and Butler, is this truly nasty one. Not a problem if you’re on Grant, but if you were riding a bike down the sidewalk on Butler, you could fall in pretty easily. This would be right after you clobber the pedestrian walking out of the bank on Grant. Maybe more importantly, note the brand-new ADA-compliant approach. If you were in a wheelchair, crossing Grant, you would very nearly nail one of those outermost two slots. Good news! I provided a list (as per above) to PennDOT, City of Pittsbugh and Allegheny County this morning, with photos where available. PennDOT had asked for the information, with the implication that they’d try to do something about them. Following the meeting today, Allegheny County said they’d get on the ones that they own/maintain ASAP – normally that would mean immediately, now means as winter workload permits. Babcock and Siebert are theirs. Don’t know about these new ones. Will keep you all posted. Keep sending them in as you find them, and I’ll keep getting them to the proper folks. This actually is enough like a drain grate to be worthy of mention. 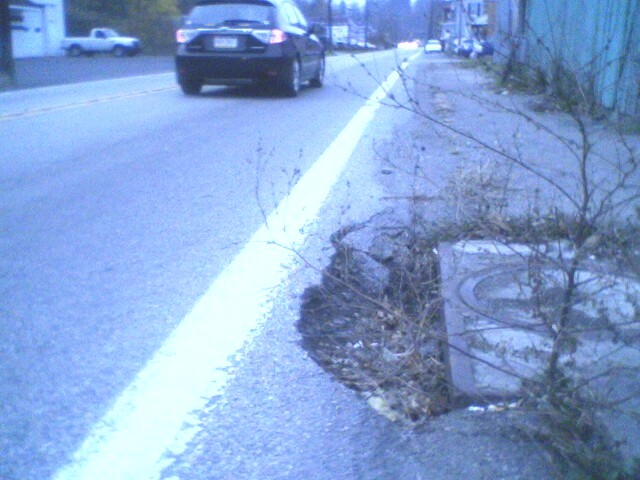 It’s an immense hole on northbound Babcock Blvd, just outside Millvale, and only about 100 yards away from the ones I mentioned above on that bridge. It is right in front of #1440. It’s actually a hole-in-the-curb drain that has badly eroded, creating this hole that’s big enough to cause trouble to a car that hit it. I can only imagine how big this thing will get over winter. 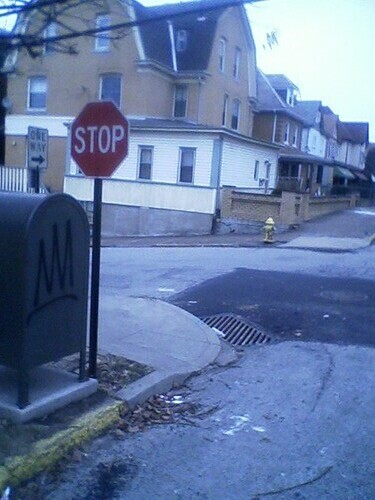 9th Avenue at Andrew, in Homestead/Munhall. Note that this is a one-way street, so it is entirely likely one might make a left turn from the left lane here, so this is right in line with a bicycle’s path of travel. Here’s another one Downtown, on 4th Avenue, just as you might want to turn right into the parking garage before Wood Street. Top. Sara, any news on this front? I provided the original list to PennDOT, Allegheny County and the City last November (?). PennDOT thanked me, said they wished they had all that information earlier in the maintenance season. Allegheny County said thenks, and that they’d get right on it. The City might have said thanks. I thought this post from Stu might be a “oh wow, they fixed Babcock Boulevard” message, to be honest. I am adding the new “finds” to the list, and will provide the information to the same three parties next week, if possible. I suspect we’ll see more action (from them) when they are less concerned with snow removal. Yet another one on private property: Exiting North Hills Village Mall’s north access lane, at the light, in right lane as you go past Staples, is one JUST LIKE THAT HORRID ONE in the first photo, page 1. Monstrous slots, perfectly in line with line of travel. Sorry, no photo. I was (gasp) driving. From a tweet; sorry no photo. Holycrap! 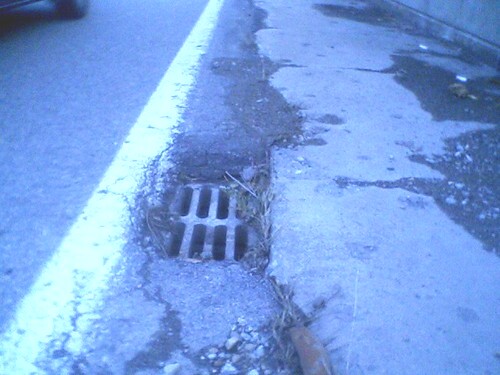 Horrid longitudinal drain grate in bike area of Chartiers Creek Bridge on Windgap Ave. Recently rebuilt bridge, there’s no excuse! * No change to those couple on Babcock just outside Millvale, or the big hole. In another year it will be large enough to swallow a car tire, then it’ll get fixed. It looks like they painted the curb. The slots are only half the problem. There is a huge depression for this that would potentially flip a bicycle, and it’s right in the middle of where one turns. There are two of these, one on the NE corner, one on the NW corner (shown). The slots aren’t that wide, but if you had a road tire in the 25-or-less range, you could well drop into this. There are probably 50 of these around the city; I counted at least 10 while riding around the North Side. This is a photo stu posted a while back. 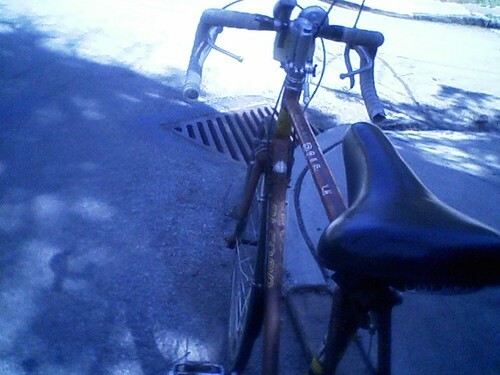 I actualy hit this grate with my rear wheel at got a flat (this was around 1 year ago). Good thing it wasn’t my front wheel. It would have been real bad. Fortunately, that one is now gone. What I worry about is someone fairly new to road riding hitting one of these straight on, resulting in serious injury. You don’t have to fall completely into one, just hit it at a bad enough angle to cause loss of control. I was riding close behind a car and didn’t see that grate until the last moment. I pulled up on the front to avoid a front wheel death flip but, my back wheel got sucked it. I’ll touch base with the County again. I should see them on Thursday. They claimed that they were waiting for the end of the plowing season to make some manpower available. Should be close to that time now, right? Took a breakfast ride I’ve been wanting to take for a while, up the hill to eat at Hot Metal Diner on 837 in West Mifflin. 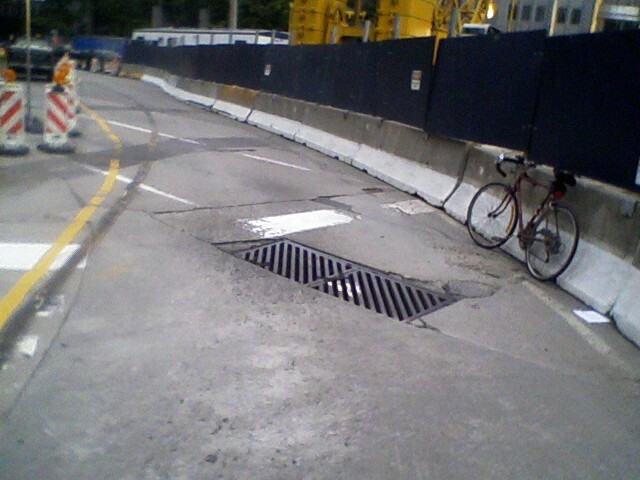 Coming back, on 837 North, on the new bridge built with stimulus money, I saw the worst bike-eating drain gratings I’ve ever seen. It’s in Hays, which I believe is different from Pittsburgh. There’s 5 or 6 of them. It’s an accident/injury waiting to happen. 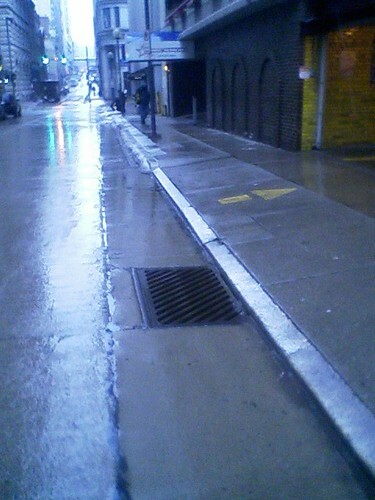 The Allegheny County Department of Public Works reports that they have fixed the problem grate on Neville. They will be addressing the multiple grates on Babcock in Millvale in the very near future. While it seems like they took a long time to get to this, it is fair to say that the winter presented an obstacle to this work, and their ability to get staff to it. They were very responsive once I resubmitted the list to them earlier this month. PennDOT also reports that they will be rectifying several bridge grates (scuppers) on a number of bridges in the region. A work order has been created for the task, but I don’t know the timeframe. I also do not know (at this time) which bridges will be addressed first, or how many in total. But, PennDOT is at the table in looking at these matters. Hopefully, this is the start of a series of updates on “successes” in getting road hazards addressed. Chester Ave & Holyoke St, North Side, 2 of ’em. Baby buggy eaters, if nothing else. For these ones on quiet neighborhood side streets, I invoke the concept of the Popsicle Index. No, they are not big deals for commuter cyclists flying along behind a bus at 22 mph, but in terms of the 8yo kid trying to get to the friend’s house two blocks away, in one piece, yes, these matter. Ten years from now, those 8yo kids who are dissuaded from riding bicycles as basic transportation while growing up, become 18yo adults entirely dependent on cars for getting around because they never rode a bike.